It is now the last two days of the Bikebug closing down sale. It is a real shame to see the end of Bikebug, quite a few times this observer has been over there over the past five years for spares or help with bigger problems. There will still be help available in Nairnshire though for those with bicycle difficulties. "Well, presumably you were looking for Bikebug, the Cycle Shop in Nairn, but sadly it has now closed. Owners Steve and Alyson have decided to retire from the trade and would like to thank all their loyal customers for their support over the last 5 years. They have very kindly passed on elements of the business to bikespokes, so hopefully we can help you instead. We offer almost all the same services with one major difference – we have a van instead of a shop! 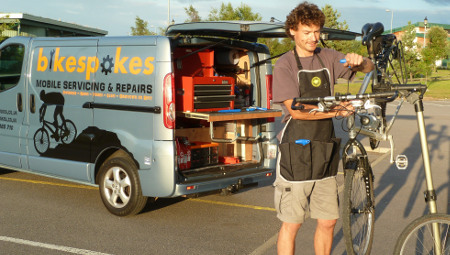 We do repairs, servicing and rental, as well as sales of bikes, parts and accessories. We started in 2014 and are based just a few miles outside of Nairn, so we are in the town on a regular basis already. You can Book an Appointment online or by phone/text or email. Our contact details are here and for some random cycling stories, don't forget to like our Facebook page too. Feel free to browse our website to see what we are all about and don't hesitate to get in touch if you want to find out more. Thanks for looking and hopefully we can be of service soon."